About 750 lives in Scotland have been saved since the introduction of the national bowel screening programme in 2007, new figures have suggested. It has emerged that just over half of those eligible for the programme actually do the test (54.5%). Nudge Day, a national day of action, is being held to encourage Scots to persuade older family members (aged 50-74) to get tested for bowel cancer. Health Secretary Alex Neil said more lives could be saved through screening. "Bowel cancer can have a devastating effect on families across Scotland and the number of lives saved could be far higher if more people took the screening test," he said. "Everyone has a part to play in encouraging parents and older family members to take the test, as it is the best way to detect the hidden signs of bowel cancer." The day follows the release of "The Poo Song", which is part of the Scottish government's Detect Cancer Early programme. It had more than 30,000 hits on You Tube in a week. It was created to increase awareness of bowel cancer and aimed at younger people to encourage them to urge their parents and older members of their family to take the test. Mr Neil added: "We think this catchy tune will put bowel cancer at the front of people's minds. Although light-hearted, the message is serious; nine out of 10 people survive bowel cancer if it's detected early and screening could save your life." Emma Anderson, from Bowel Cancer UK, said: "We encourage everyone across Scotland to get behind Nudge Day. "Bowel cancer is very treatable, especially if diagnosed at an early stage, so it is important to use and return a screening kit if you receive it. "Some people are uncomfortable about doing it or talking about the subject but family and friends should do everything they can to encourage those eligible to do the test." 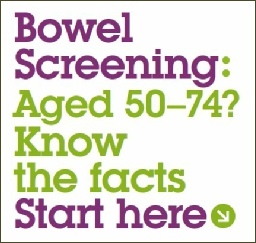 The Scottish Bowel Screening Programme invites all men and women in Scotland aged 50 - 74 to participate in screening every two years. Those over the age of 74 can self-refer every two years by requesting a screening kit through the Scottish Bowel Screening helpline.